Hey dolls! I’m back after a short unplanned hiatus due to a hectic work schedule at the moment. I’ve recently moved offices and I’m now working from a conservatory three days a week to do my day job. Within the space of a month, I’ve tanned an insane amount before I’ve even gone on holiday! Now let’s just get one thing clear, I’m not a someone who chases the sun. I’m the exact opposite. I spend my time trying to avoid being in direct sunlight for lengthy periods of time. I just don’t tan well and despite being Indian, I burn really easily too. Unfortunately my naturally tanned skin (thanks Indian genes) doesn’t go a lovely golden brown. It just looks very dirty and uneven; so this new tan that I have acquired was not a pleasant surprise. I’ve been on a mission to remove it and so I raided my beauty stash for something that would help lift it and brighten my skin tone. 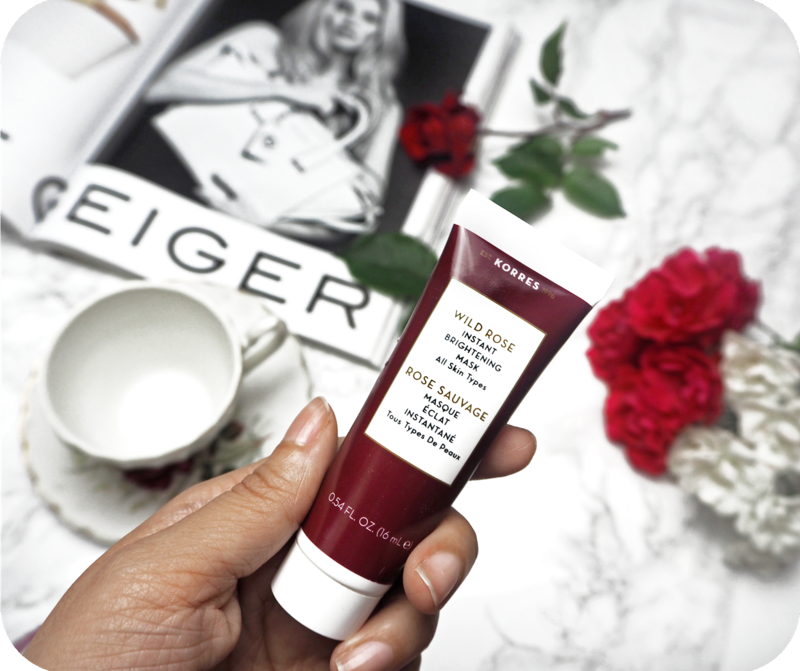 After frantic searching and some spring cleaning, I came across the beauty that is – Wild Rose Instant Brightening Mask by Korres. 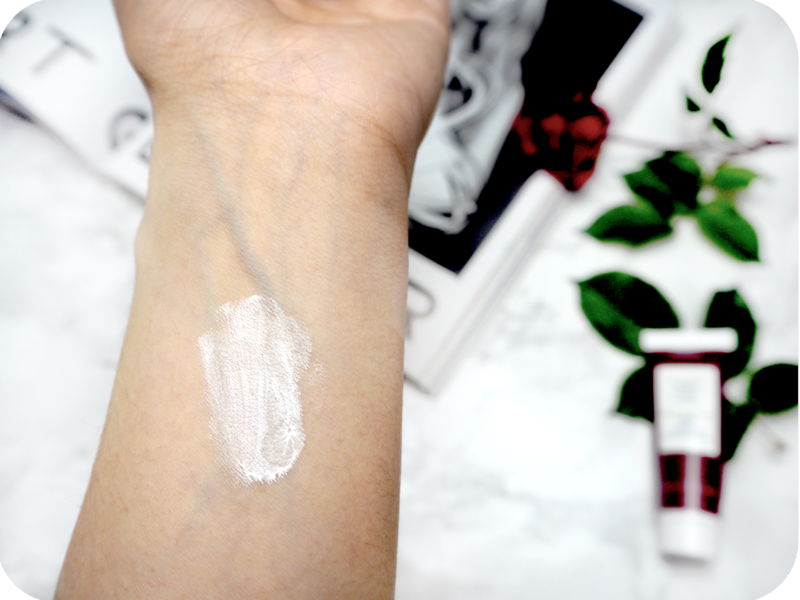 According to Korres an instant brightening effect is immediately visible from the first application. Now the sceptic in me always scoffs slightly when products claim to have an instant effect from the first use.Is that even actually possible? Well it turns out that the the main ingredient is Wild Rose oil, a natural source of vitamin C. If you know your vitamins, you know that Vitamin C is fab for significantly repairing marks on the skin and improving fine lines. Other ingredients include a complex of herbal extracts which targets skin discolouration whilst adding brightness and radiance to the skin at the same time. I must admit, this all sounded quite promising. I did do a little bit of research on the ingredients and was also pleased to see that it’s free from paraben’s, silicones, Propylene Glycol and Ethanolamines. Happy days! Generally I’m not a fan of rose scented products so I was a little bit worried about how this might smell but a quick sniff was enough to reassure me that I need not worry. The mask has a very faint floral smell that doesn’t linger. The instructions are very simple, apply to dry skin and wash off after ten minutes. I must admit, the mask was quite difficult to get off. Initially it just felt like I was spreading the white stuff all over my face and it wasn’t coming off but then with the help of a muslin cloth it was a lot easier. I have quite large pores and found that it was getting stuck in them, particularly around the nose. It did take longer then it would take me to remove any other of my masks but there’s something quite satisfying about it. I generally don’t do masks unless I have time anyway so it’s not too much of an issue for me. I wouldn’t recommend using the mask if you’re in a rush. So did I get an instant brightening result? *drum roll* The answer is….yes BUT I’m not sure if it’s just because the mask is so white and there is still some whiteness left on from it or if it’s something more scientific, either way my skin looked brighter which is exactly what Korres had claimed. I’ve used this mask 4 more times over the period of a month and every time I’ve used it I’ve fallen for it a little bit more. I feel like it’s not irritated my sensitive skin in any way and perhaps due to the extra scrubbing trying to remove it, it has actually helped to brighten up my face. 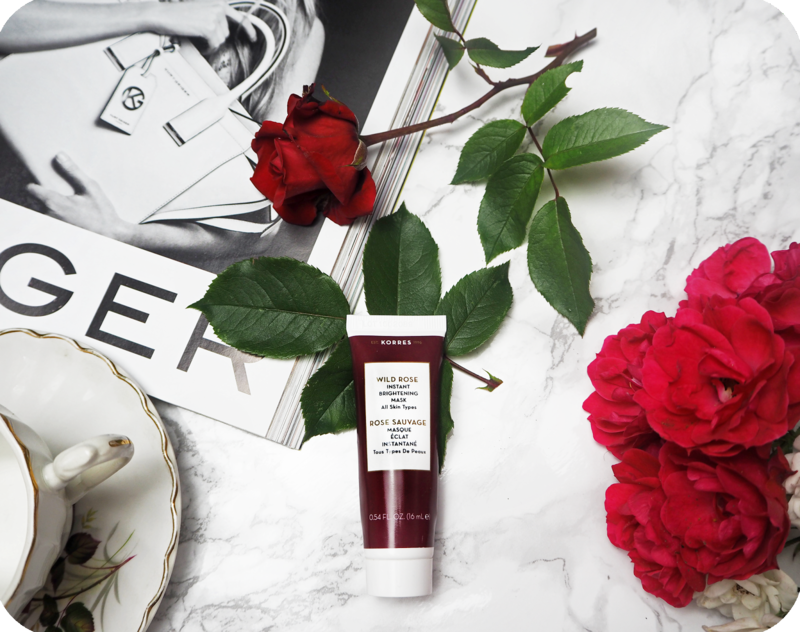 The Korres Wild Rose Instant Brightening Mask is available to buy from Look Fantastic here. Priced at just £7 it doesn’t seem at all expensive, however it’s worth noting that you do only get 16ml. I just about managed to squeeze out 4 uses and this was me using it quite sparingly. I am keen to keep trying the mask to see whether the brightening results do continue and if it will help my hyperpigmentation in the long run. For now though, I’d still recommend that you give it a go if a little extra lift in your skin tone is what you’re after. What products do you use to help brighten your skin tone?